Most C-Stands have an awesome build quality. They are not light weight and can be a bit bulky to carry on location. 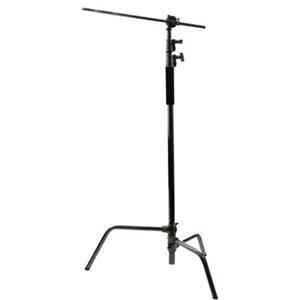 The C-Stand pictured to the right is a Kupo Master 40" C-Stand with Turtle Base Kit that can be found on Amazon.The downside to this C-Stand is that it doesn't always seem to be readily available. After picking up one at the local camera store, the next one was on backorder and took 3 to 4 weeks to show up. Currently both Amazon and Adorama don't have these readily available. However, if you are not in a rush, I think it's worth the wait. The C-Stand with boom is around $180 +/-, but it should last you for a number of years. If you see a price in the $140 +/- range, you will likely note that it's without the boom arm attachment. If you are in need of a C-Stand sooner than you can put your hands on a KUPO, Interfit Photographic makes one for about $40 less with the boom arm that you can find on Adorama. I own two Interfit C-Stands but only plan to buy KUPO if at all possible moving forward. The turtle base demonstrated in the video below along with the build quality are two things that are worth the extra $40 in my opinion.